Micronutrients, such as Vitamin D, the B Vitamins, etc., function as a component of physiology. It therefore makes sense that their intake requirement would be based on their function. 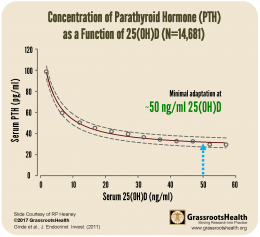 Take the concentration of parathyroid hormone (PTH) as it relates to 25(OH)D as an example. A physiological function of vitamin D is to regulate calcium absorption. Low calcium absorption (caused by either low Ca or D) causes PTH to rise, which increases the activation of vitamin D to then increase Ca absorption. 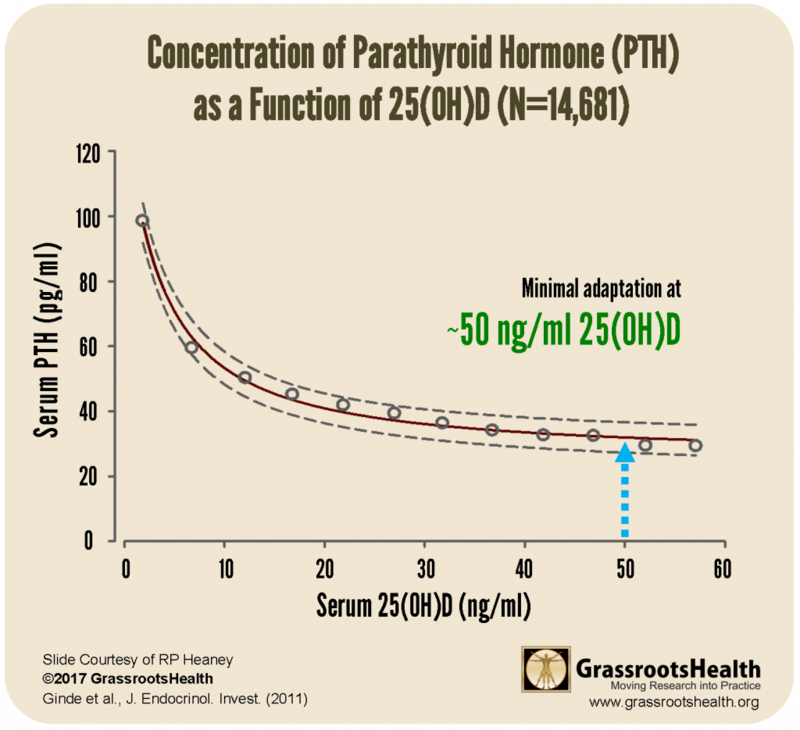 As illustrated in the chart below, PTH varies inversely with vitamin D status when 25(OH)D concentration is inadequate. The point at which the inverse slope turns to zero is the point at which no further compensation occurs (PTH level remains stable), which is around 50 ng/ml 25(OH)D. Therefore, from a physiological perspective, ‘normal’ vitamin D status would be a 25(OH)D concentration that required little or no compensatory PTH response under basal conditions, where minimal adaptation is necessary, at around 50 ng/ml. These findings can be explained further in a publication by Ginde et al., Defining Vitamin D Status by Secondary Hyperparathyroidism in the U.S. Population.